Located at the intersection of the Downtown and Miami Arts District, the Marriott Miami Biscayne Bay Hotel offers gorgeous waterfront views just minutes from the Port of Miami. 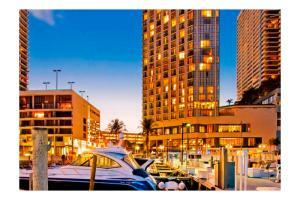 This luxurious downtown hotel's 580 rooms and suites, many with bay views of Miami, feature laptop, MP3, flat-screen TVs and video connectivity. Located at the intersection of the Downtown and Miami Arts District. Only 7 miles from the Miami International Airport.